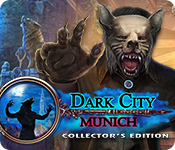 4Friends Games present the next adventure in their globetrotting detective series Dark City! It’s Oktoberfest time in Munich, Germany, the biggest celebration of the year! But this year, the festivities are being spoiled by a series of violent attacks. The witnesses claim that werewolves are responsible, but that can’t be true, can it? Track down the clues and discover the truth for yourself in this clever hidden-object adventure game! Munich’s Oktoberfest hides a dark secret – werewolves are afoot! A sizzling take on the classic tale of greed, yearning, and redemption. Can you catch the kidnapper in time to save your brother? A powerful artifact is stolen, threatening to shatter time itself. Can you save your hometown from dangerous monsters in time? When your world and the supernatural realm collide, can you survive? Can you stop a crazed kidnapper in time? Can you uncover the secrets behind the Giants' attacks in time? You are sent to a remote island to solve a simple case that quickly turns into a cat and mouse game between you and the culprits. Work with new puppet allies to uncover the true puppet master! Can you save your brother before your kingdom is destroyed? You'll die in three days if you can't uncover the truth! Can you stop a strange disease from another world? Nobody comes back from the Dark Side unchanged, but it’s the only way to re-light the fading flame.